All belts in stock on ProAmBelts.com are customizable with artwork. On stock and fantasy football championship belts the customizations are limited to artwork in specific locations of the belt. 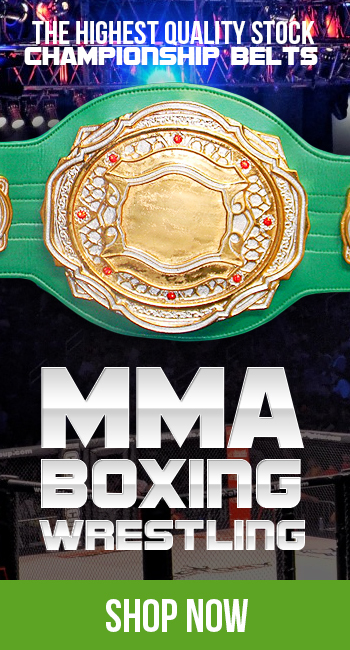 If you are interested in a fully custom championship belt check out our showroom or contact us today to start your order! View available belts from Stock Belts, Fantasy Football Belts, Sale or Damaged Items. Click Contact Us, and fill out the form. When you come to "reasons for contact us" select Artwork/Layout. After you hit send we will contact you back via email with 01 business day or less which you can then send us the files, logos, artwork, wording and we will be able to do the layouts for you and continue to makes changes until we get your approval on your customized stock belt. After approval, you can add the stock belt and customize feature to your cart, and even upload your artwork and checkout. After artwork approval and payment is made, we can then start production on your order. Standard orders take 5-7 business days and there is an option for RUSH orders which take 2-3 business days. Please note that stock belts are customized with commercial grade digital vinyl prints within the blank areas on our metal belts, while fully custom premiere belts are made by by the artwork being etched /lasered /cut into the metal.